(1) Check the presence or absence of ore or iron in the crushing chamber. If there is ore or iron, it must be removed before starting. (2) Check that each electrical interlocking device and various signal instrumentation devices are in good condition. (3) In order to ensure the product granularity; carefully check whether the width of the discharge opening meets the requirements before driving, otherwise it should be adjusted. (4) Check the oil level and oil temperature in the fuel tank. When the oil temperature is lower than 20 °C, the vehicle should not come. (5) Check the oil pressure of the locking hydraulic cylinder, and the adjusting ring can be started under the locked state. For the fixed tooth plate, check whether the fixing bolts on the tooth plate, that is, the adjusting ring, is firm. (1) Start the oil pump, check whether the berthing pressure is within the range of 0.05 ~ 0.12mpa, and check all lubrication equipment according to the oil flow indicator, pressure gauge and thermometer. The pressure of cooling water should be 0.025 ~ 0.05mpa lower than the oil pressure, so as to avoid water infiltration into the lubricating oil. (2) Start the lubricating oil pump for 3-5min, wait for everything to be normal, and then start the crusher according to the specified starting signal. After the crusher idling for 1-2min, make sure that everything is normal before the mine production. (1) The ore must be uniform and the particle size must meet the requirements. (2) Pay attention to mine discharge and transportation at any time to avoid accidents caused by blockage. (3) Always check whether the oil pumps, cooler, filter is working properly, and the oil return temperature should not exceed 60 °C. (4) Always check the water-tight drain of the water seal. If there is no water, it will not work. If there is oil in the water, it is because the oil return ring on the spherical bearing seat is blocked by the temperature return hole. (5) Always check the oil pressure of the locking hydraulic cylinder. The adjusting ring must be operated under the locked state. 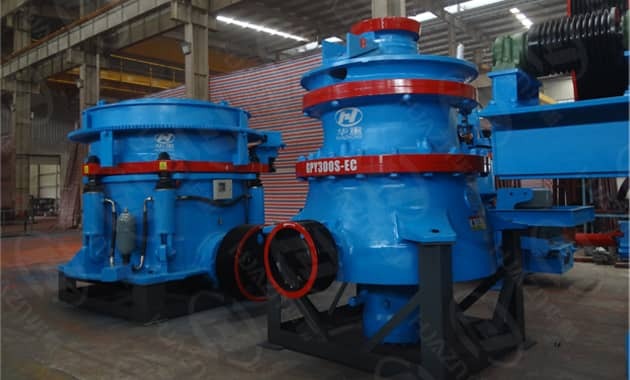 (6) Pay attention to the meshing sound of the transmission part and the gear and the sound of the crusher operation, and whether the motor operating current is normal. (7) Regularly check the wear of the lining plate, paying special attention to the lining plate fixing bolts on the whole ring, otherwise the lining plate will be loosened. After the new lining plate works for 24 hours, it should be stopped and tightened once. (1) Stop the feeding machine first, and after the ore in the crushing chamber is completely discharged, stop the crusher and stop the oil pump and the discharging conveyor. (2) When the room temperature is lower than 0 °C, the water in the water seal should be drained after parking to avoid freezing.